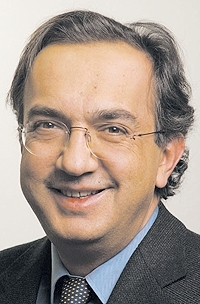 Fiat S.p.A. CEO Sergio Marchionne and a team of Fiat senior executives visited Chrysler LLC headquarters in Auburn Hills, Mich., on Saturday morning, according to a letter to Chrysler employees from CEO Bob Nardelli. The Fiat team visited a display of vehicles in Chrysler's design dome and met with Nardelli; Tom LaSorda, co-president; Frank Klegon, executive vice president of product development; Frank Ewasyshyn, executive vice president of manufacturing, and other executives. "This was a very positive meeting," Nardelli's letter said of the Fiat visit. "This potential alliance is very promising, but getting there is totally contingent on meeting the viability plan required of us by the U.S. Treasury. "We must work even harder to find ways to reduce costs while investing in product improvements and innovation that will support our sustained viability for the long term. We're stepping up this process." To make the alliance and the bailout work, Nardelli told employees, Chrysler is seeking price reductions from suppliers and wants them to freeze material cost increases for 2009. Chrysler told dealers at the National Automobile Dealers Association convention that it was reducing dealer margins and reviewing dealer payment terms. Chrysler has gotten the UAW to agree to eliminate its jobs bank program and seeks to restructure its obligations to retirees. Many of the cost reduction plans were outlined by Nardelli in his testimony before Congress last month. In addition, Chrysler continues to negotiate with the Canadian government for completion of a $1.3 billion bridge loan ($1.6 billion Canadian). Chrysler expects the Canadian government to require concessions similar to those required by the U.S. government.